I ran into this issue recently when tinkering with some old mobile code I had for AIR for iOS. Previous versions of AIR (3.2) compiled the project fine, and it launched great on the iOS devices. Once I updated to AIR 3.5 or up, the app compiled and installed, but simply showed a blank white screen when I tried to launch it on the device. After a bit of web search, it turns out the culprit is TLF text. 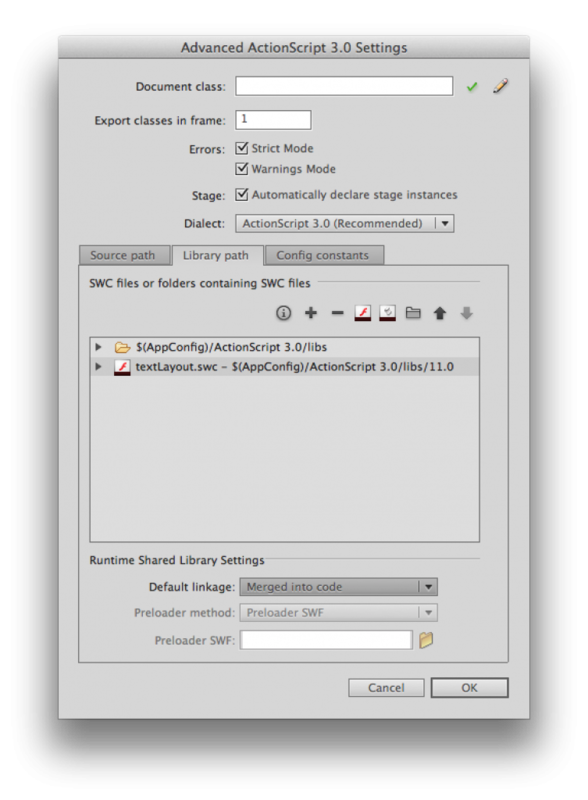 Simply “Merge into code” the textLayout.swc instead of the default “Runtime Shared Library”. I read somewhere about Apple changing their requirements, and now in order to use TLF text, Adobe had to make it so only ‘merged into code’ would work in newer versions of air. After applying that quick fix, your apps should launch just fine, and no more ‘white screen of death’.